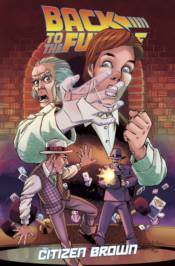 Time-traveling into comics directly out of Telltale's 2010 smash-hit episodic videogame BACK TO THE FUTURE: THE GAME! When an empty time-traveling DeLorean suddenly shows up in 1986, Marty McFly quickly learns that his friend Doctor Emmett 'Doc' Brown is stranded in 1931 and possibly in mortal danger. Now it's up to Marty to return to the past once again to save Doc and the time-space continuum!